Posted on January 6, 2014, in Monday Meeting Miracles and tagged 12 step, 12 step program, AA, Addiction, Alcohol, Alcoholic Anonymous, Alcoholism, Big Book, Christianity, Clean and Sober, fellowship, God, Health, Higher Power, Home, Meeting, Mental Health, Miracle, Monday, one day at a time, Recovery, Sobriety, Support group, Twelve Step, Twelve-Step Program. Bookmark the permalink. 9 Comments. Ouch! So sorry for your fall. Aren’t you glad it didn’t occur as a result of too many glasses of vino! That would be emotionally painful as well! Love your blog and it’s new look! I just laughed out loud! I shared this story at my meeting, and every person that shared after me related an alcohol-related fall! And yes, I can imagine that feeling all too well, as it happened to me on more than one occasion! Thanks so much for the positive feedback, it means the world to me! Sorry about your fall! Hope you are feeling better. Love the chart you posted. Definitely a good reference! Oh, I am soo sorry about your fall! I hope it’s nothing seriouse and you heal quickly! I am so with you on the get out of jail free card! My mind would have been fantasizing a drunk fest for sure! And you know if this happened if you were drinking it would have been way worse. Omg. I was constantly finding some random injuries on myself. Ugh. You sure brought an almost forgotten memory bubble. I am so grateful that we are sober my friend! Now if the weather would just ease up with the damn cold… I swear I am ready for the beach. Thanks, Maggie, even 24 hours later I am feeling improvement, so there is light at the end of this tunnel. And yes, it would have been way worse if I had been drinking, and I can state that unequivocally since I have had such accidents while drunk. Not pleasant memories, that’s for sure. And yes, I am totally over this winter, and I don’t even want to turn on the news anymore, I am so sick of hearing about it. Stupid polar vortex 🙂 This weekend it is supposed to let up, so at least there’s light at then end of that tunnel as well! Yes, very sorry to hear of your fall, though can sympathize with being dazzled by the sight of a freshly vacuumed set of stairs. Pre-coffee is a dangerous time already. I’m glad your trip to the doctor’s was uneventful and positive for you. Sending healing thoughts your way. That chart is interesting. I’ve never seen it before. 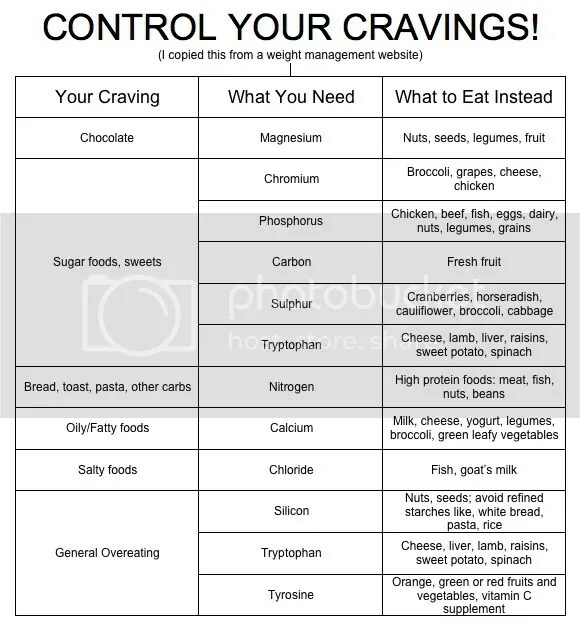 I am like you in that I pretty much crave it all, but if I ate everything on that chart instead of chocolate and empty starches, well, maybe I wouldn’t have the cravings. Slowly but surely this stuff is starting to sink in. Thanks for sharing it! I’m loving the positive feedback on the chart, I was sort of being funny putting it up, because in my mind, if I feel like eating something sweet, I’m pretty sure I’m not choosing fish as an option. Now I need to go back and take a closer look at it. I really need those healing thoughts, because I am ready to get back to the couch to 5K thing (and, let’s face it, I will be starting at ground zero by the time I do get back to it). Let’s shoot for a spring race so I have a goal! Anyway, starting with the Doc’s opinion is as good as it gets. I still get something out of it when I read it today. So much has gone on in medical knowledge of alcoholism, and yet Silkworth’s words are as true today as they were then. My favourite part (or one of) is the part about our lives being the only normal ones. I too felt like that. I couldn’t understand how people didn’t drink just to leave the house. Or to talk to others. Or hid the copious amounts of booze like I did. Or just fogged up by the ego of my mind, and the booze. Lying, cheating, stealing. how did others not do those things? That’s because i didn’t know the true from the false (another line). Oh what a wicked web we weave, Josie. Thank you for this reminder, and also for that chart – loved it too! !